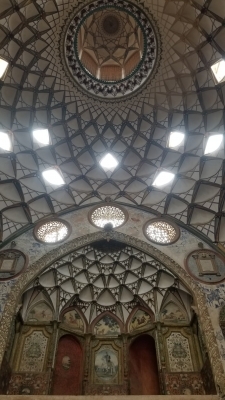 The Persian House in Central plateau of Iran is part of the Tentative list of Iran in order to qualify for inclusion in the World Heritage List. Kashan is potentially a hotspot for WHS but even without the title it is a superb stop for a full day of sightseeing. The brochure handed to me talks of more activities in and around town but the highlights surely are the Fin Garden (already WHS), Agha Bozorg Mosque as well as the numerous historical houses in the center of town plus Sialk Hills once they finish setting up the museum. The houses are hard to miss. The center of Kashan has an entire district with them. I cannot say which one is the “best” because as great as they are after 3 it becomes a little repetitive so I didn't visit more. Even with the cheap ticket I didn't want to spend more time on it. I personally liked Borujerdiha the most. It is impressive, gave me a wow effect stepping into the courtyard which doesn't happen often, the beautiful decorations and perhaps because it was the first one I visited. The benefit for the house is the close location to the main road entrance so I started out there. The stone carvings all over are beautiful. The courtyard have steps going down at each corner into the neat fountain, and the main attraction is the house at the end. The cellar is empty but the back has wood carvings in between the well designed upper section stone carvings. Each corner of the room shines something new into your eye. If a section of the room is currently occupied by a couple taking pictures, move on and find something else, it won't matter where you look as there is no boring area. One room was used as a shop but the ladies didn't mind you taking pictures, the other room was unfortunately semi blocked off by a dress up photo shoot for the kids. You can still make out most of the beauty behind the barrier though. Some houses have rules for cameras, mainly concerning flash. One was quite strict but the others friendly to take my word I don't take any pics with flash. Overall I think the houses should immediately be placed on the world heritage list and I am shocked it took until 2017 to even consider it. There will be a few years of queueing behind the massive amount of other Iranian tentatives. I am thinking “Historic Persian Houses” would be a better title than the current one.